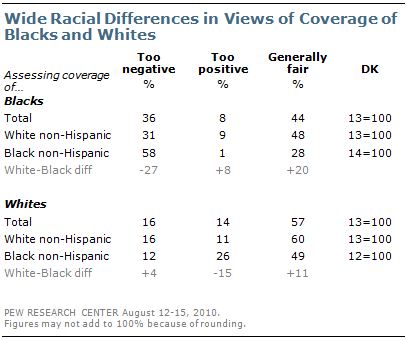 In evaluating news coverage of different groups, pluralities of Americans say that coverage of poor people and Muslims is too negative, while somewhat smaller percentages say the same about coverage of blacks and Hispanics. Among eight groups tested, whites and middle-class people are the only groups that majorities say are treated fairly by the press; 57% say that news coverage of whites is generally fair while 56% say the same about coverage of middle-class people. Notably, about a third (32%) say that coverage of wealthy people is too positive — the highest percentage for any group included in the survey. About as many see coverage of the wealthy as too positive as say it is generally fair (31%). These are the results of latest weekly News Interest Index survey, conducted Aug. 12-15 among 1,005 adults by the Pew Research Center for the People & the Press, which also finds that Americans continued to track the oil leak in the Gulf of Mexico last week more closely than other major stories. 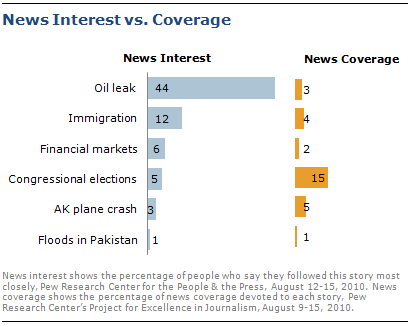 With coverage of the leak down significantly, the public’s high interest likely reflects the perceived importance of the story; 44% say this was the story they followed most closely, while the spill accounted for just 3% of the newshole, according to the Pew Research Center’s Project for Excellence in Journalism. The survey also shows that the public is divided over whether news organizations devote too much coverage to race relations in this country. Still, close to half (48%) say the media make relations between the races seem worse than they actually are, while about a quarter (24%) say they reflect race relations as they really are. Just more than a third (34%) say news organizations give too much attention to race relations, while a comparable 31% say they give these difficult issues too little coverage and 25% say the amount is about right. African Americans are much more likely than whites to say news organizations give too little attention to race relations (51% vs. 24%), though pluralities in both groups (42% for blacks, 50% for whites) say the media make race relations seem worse than they actually are. About four-in-ten Democrats (41%) say news organizations give race relations too little coverage, compared with 20% of Republicans and 32% of independents. Republicans, on the other hand, are much more likely to say that race relations get too much coverage (47%), compared with 29% of Democrats and 32% of independents. 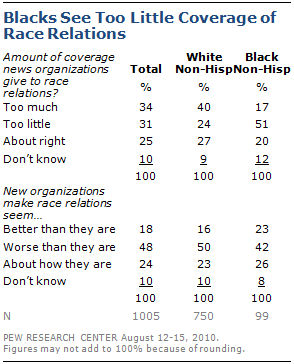 Those 18-29 are more likely than other age groups to say that the media gives too little attention to race relations. About half (49%) say this, compared with 18% of those 65 and older. Again, the differences narrow when people are asked to assess the coverage. For example, 41% of those 18-29 say news organizations make race relations seem worse than they are, just about the same as the 44% of those 65 and older who say this. When assessing news coverage of Muslims, older people are less likely than others to say coverage is too negative — just 24% of those age 65 and over say this, compared with more than four-in-ten of those in younger age groups. College educated Americans are significantly more likely than those who have not attended college to say media treatment of Muslims is too negative; a majority of those with college experience (53%) say this, compared to just 30% of those with a high school education or less. 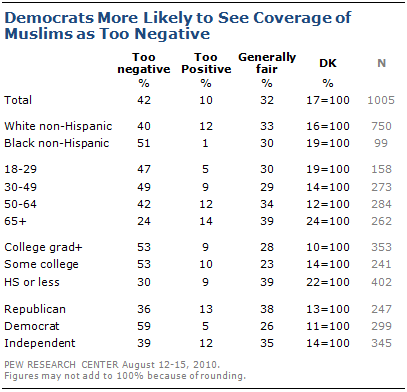 And while a 59% majority of Democrats say press coverage of Muslims is too negative, Republican and independent opinion is somewhat more divided. Republicans and independents are about equally likely to say coverage is generally fair (38% of Republicans and 35% of independents) as to say it is too negative (36% of Republicans and 39% of independents). Nearly six-in-ten African Americans (58%) say that news coverage of blacks is generally too negative. A sizeable minority of whites (31%) also says that blacks are portrayed too negatively in news stories. Still, nearly half of whites (48%) say media treatment of blacks is generally fair (just 28% of blacks say this). African Americans also are more likely than whites to say that media coverage of Hispanics is too negative (48%, compared with 32% of whites). Pluralities of both blacks (49%) and whites (60%) say that news coverage of whites tends to be fair, while just 16% of whites and 12% of blacks say it is too negative. Blacks are somewhat more likely than whites to say media coverage of whites is too positive, although just 26% of blacks say this (compared with 11% of whites). There also are substantial partisan differences in these views. Majorities of Democrats say news media coverage of blacks (52%) and Hispanics (52%) is too negative; about two-in-ten Republicans say this about news coverage of each group (22% for both blacks and Hispanics). About a third of independents say press coverage of blacks (35%) and Hispanics (33%) is too negative. Similarly, Democrats are about twice as likely as Republicans to say news coverage of gays and lesbians is too negative (40% vs. 22%); 30% of independents see coverage of gays as too negative. Younger people also are more likely than older people to say portrayals of gays and lesbians in the press are too negative; 36% of those younger than 50 say this, compared to 27% of 50 to 64 year olds and just 19% of those age 65 and older. Republicans and Democrats offer differing views of coverage of people at every income level. 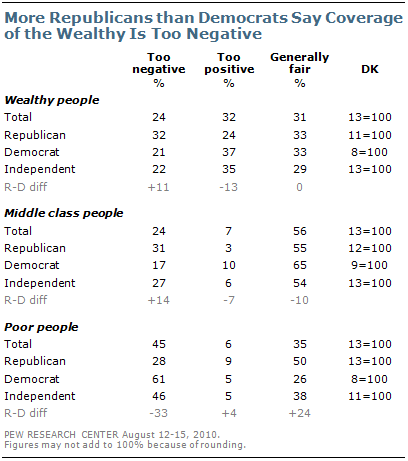 Nearly a third of Republicans (32%) say coverage of the wealthy is too negative, about the same number who say it is generally fair (33%); 24% of Republicans say press coverage of wealthy people is too positive. By contrast, Democrats are substantially more likely than Republicans to say press coverage of the affluent is too positive (37%), while just 21% say it is too negative. Independent views of coverage of wealthy people mirror those of Democrats. While majorities of Republicans (55%), Democrats (65%) and independents (54%) say news coverage of the middle class is generally fair, Republicans (31%) and independents (27%) are more likely than Democrats (17%) to say the media is too negative in its treatment of middle class people. A clear majority of Democrats (61%) say the media is too negative in its coverage of the poor; 46% of independents and just 28% of Republicans say this. Public attention to the major oil leak in the Gulf of Mexico has yet to drop off as significantly as media coverage. Currently, 39% say they followed news about the leak very closely last week, not much different from the 42% that said this one week earlier. Still, that is down sharply from 59% in the July 22-25 survey. More than four-in-ten (44%) say this was the story they followed most closely last week. The oil leak accounted for 3% of the coverage measured by PEJ, down from 11% one week earlier. With the underground well largely sealed, coverage has declined greatly since a peak of 44% of the newshole in mid-June. More than a quarter (27%) say they followed news about the immigration debate very closely last week, while 12% say this was the news they followed most closely. News about immigration made up 4% of the newshole. Two-in-ten (20%) say they followed news about this year’s congressional elections very closely, while 5% say this was the news they followed most closely. News about the elections, including several hotly contested primaries, proved to be the most covered news of the week, accounting for 15% of coverage. Fewer than two-in-ten (17%) say they followed news about recent ups and down in the stock market very closely; 6% say this was the news they followed most closely. 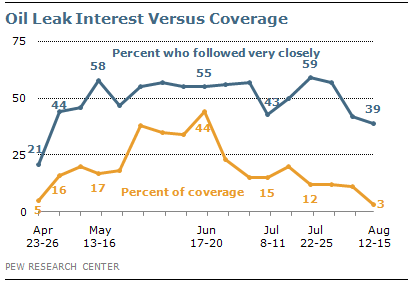 News about the financial markets accounted for 2% of coverage. Economic news more generally — including the market fluctuations — accounted for 12% of coverage, according to PEJ, making it the second most reported news of the week. Just 8% say they very closely followed news about the floods in Pakistan; 1% say this was the story they followed most closely. The flooding accounted for 1% of coverage. And 7% say they very closely followed news about the Alaska plane crash that killed former Sen. Ted Stevens; 3% say this was the news they followed most closely. The crash accounted for 5% of coverage. 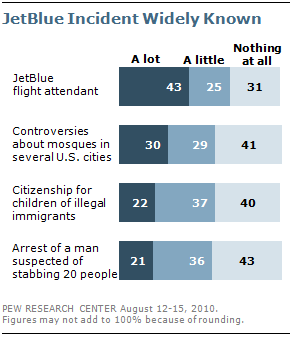 More than four-in-ten Americans (43%) say they heard a lot last week about the dramatic exit by JetBlue flight attendant Steven Slater from his plane at New York’s Kennedy Airport after an argument with a passenger. A quarter (25%) say they heard a little about how Slater had quit his job, opened the plane door and hopped on the emergency exit chute. About three-in-ten (31%) say they heard nothing at all about this story. Fewer say they heard a lot (30%) about controversies over plans for mosques in several U.S. cities. Debate over building a mosque near the World Trade Center site in New York City continued to generate controversy this week, especially after a series of comments by President Obama about the issue over the weekend. About three-in-ten (29%) say they heard a little about this issue, while 41% say they had heard nothing at all. Close to four-in-ten Republicans (38%) say they heard a lot about this, compared with 28% of Democrats; 30% of independents say they heard a lot as well. Just more than two-in-ten (22%) say they heard a lot about the debate about changing the Constitution so that children of non-citizens born in the United States would no longer automatically be U.S. citizens. Another 37% heard a little about this debate, while 40% say they heard nothing at all. On this, there are no significant differences among partisans. Awareness of that story was similar to awareness of news about the arrest of a man suspected of stabbing as many as 20 people. About two-in-ten (21%) say they heard a lot about this story, 36% say they heard a little and 43% say they had heard nothing at all. These findings are based on the most recent installment of the weekly News Interest Index, an ongoing project of the Pew Research Center for the People & the Press. The index, building on the Center’s longstanding research into public attentiveness to major news stories, examines news interest as it relates to the news media’s coverage. The weekly survey is conducted in conjunction with The Project for Excellence in Journalism’s News Coverage Index, which monitors the news reported by major newspaper, television, radio and online news outlets on an ongoing basis. In the most recent week, data relating to news coverage were collected Aug. 9-15, and survey data measuring public interest in the top news stories of the week were collected Aug. 12-15, from a nationally representative sample of 1,005 adults.